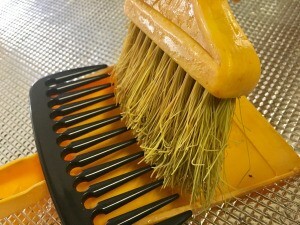 By gluing a wide tooth comb to the handle end of your dustpan you can add this great dust bunny removal feature. This guide contains a DIY comb-top dustpan project. Attach a wide-toothed comb with hot glue to your dustpan in order to brush out all the debris and dust bunnies from your broom. This dollar hack is a copycat of a $25 dustpan I saw at the Home Goods store. Very practical. I like this. And where you find the big, big comb? It looks like a section of a wrought iron fence.